So, you may be wondering why I’m writing this as I’m not Catholic, not even Christian, but I am very much so a fan of the current Pope. I have to admit, I’d never really followed any of the previous popes with any major interest, but Pope Francis – Papa Francesco – is someone I admire greatly. As a person in general, regardless of what you think of his spirituality or closeness to God, he’s done so much for inter faith dialogue that I somehow wish politicians were half as wise, and he repeatedly uses his position for good, advocating charity and helping the poor and marginalised people and is actively involved in areas of political diplomacy and environmental advocacy. I had the immense good fortune to attend a mass he performed in Milan this weekend. He was up for a 1 day visit so I knew I had to go and see him. Hi day started by visiting some of the cities “White Houses”, an impoverished area on the outskirts of Milan where he met families including a Muslim one – told you he was awesome on the interfaith and underprivileged stuff, then he headed into Milan for the Angelus at the Duomo. My first encounter with him started here as I caught a glimpse of him as he left Piazza del Duomo on his #papamobile (yes, it even has his own hashtag!). The emotion in the crowd was palpable and throngs of people lined the street to wave and cheer as he passed. I initially had planned that this would be the full extent of my interaction with the Pope, it’d just be nice to see him, give him a wave, get a photo, with a curiosity equal to that of seeing the Queen of England, but once caught up in the furore of the day, I knew this wouldn’t be the end, so while the Pope went to eat lunch with inmates at Milan’s Casa Circondariale di San Vittore prison, I made my way to Monza. 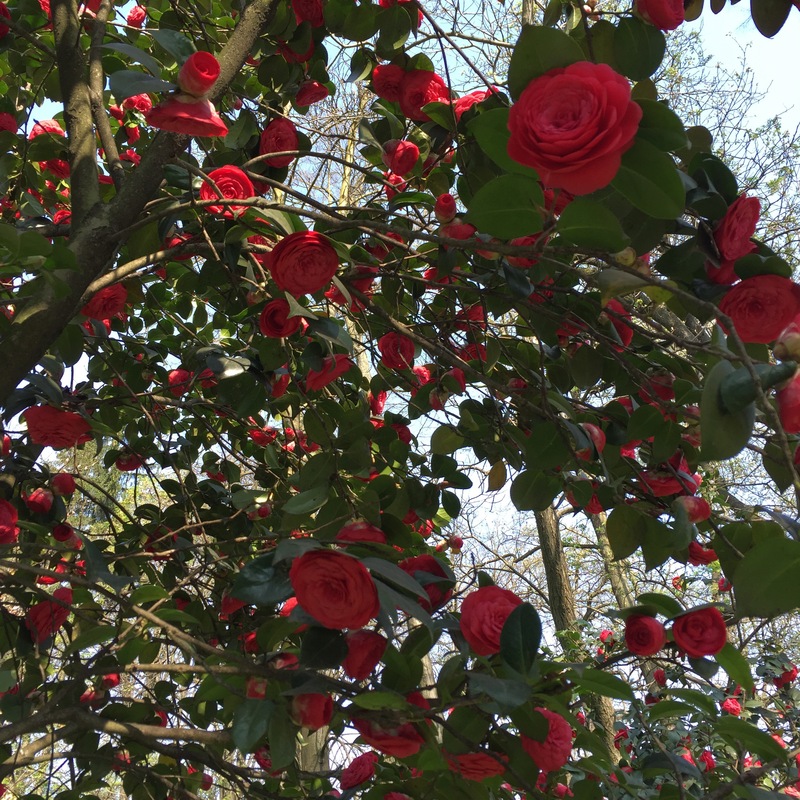 Monza is a city in its own right, about 15km to the North of Milan, it took about a 20-minutes on the train. It’s famous for its Grand Prix Racing circuit which hosts the F1 Italian Grand Prix (not that I have any interest in that!). 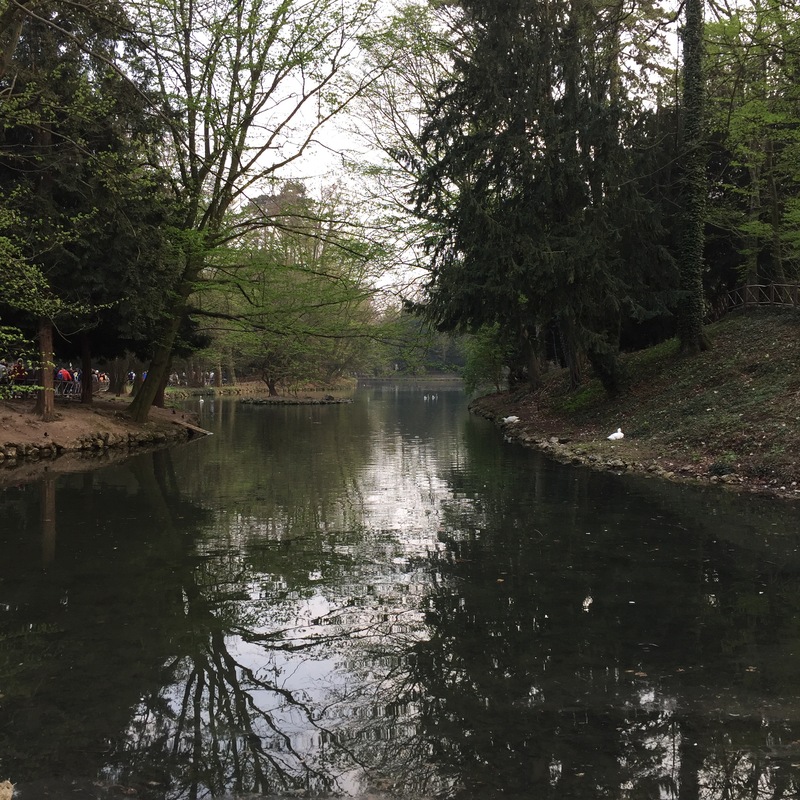 Monza Park is one of the largest in Europe and is beautiful, so in following the Pope to Monza for his mass I figured at the very least I’d get to have a nice day out in a new city. and then reached the open plain set out for the mass. They also hold concerts here so it’s well equipped for large crowds. 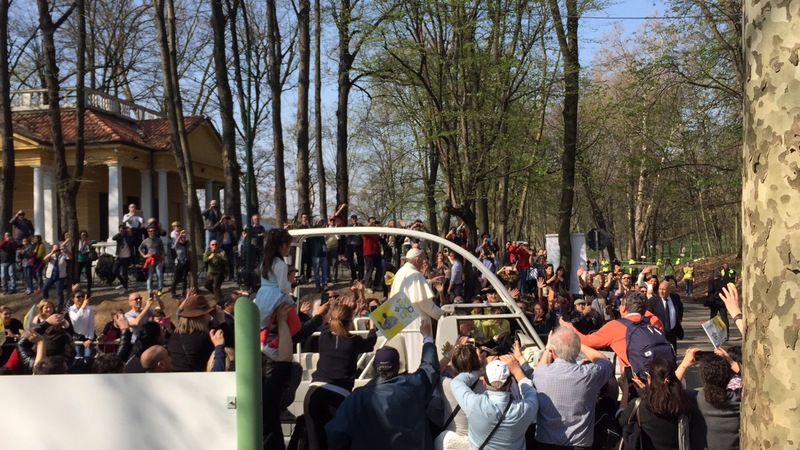 700,000 were expected to come to see Papa Franceso, and that’s ticketed people, within the fenced area, many more were gathered outside on the hillsides and grassy areas beyond. You can’t see them on the picture but people were flying flags from all over the world, Venezuela, Phillipines, Poland, I even saw several “Pride” flags. Mass wasn’t due to start until 15.30 but instagram had told me that people had been there since the morning, getting themselves a good spot and indeed, there was little room to move, end of the day estimates talked of 1,000,000 people there that day. 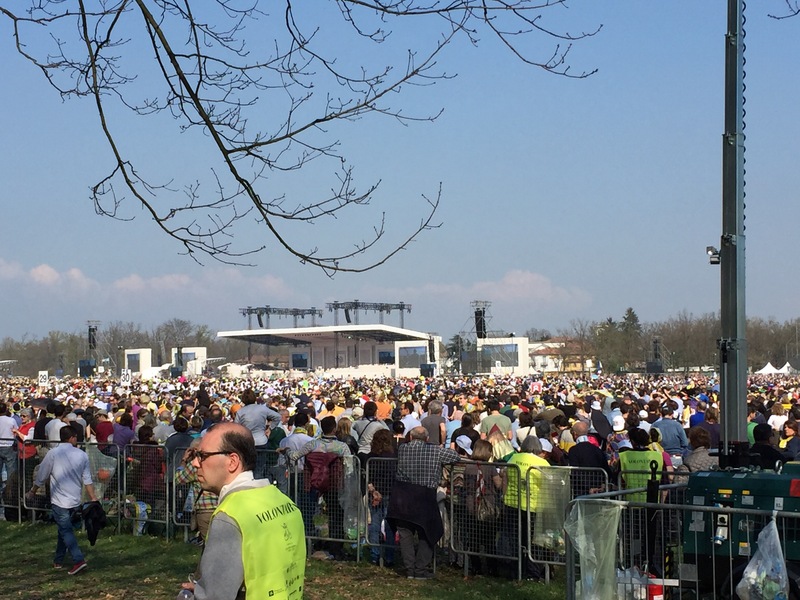 A stage in the centre of the field was set up, with several large screens dotted around the stage and throughout the fenced area, exactly as they would for a pop star, and really, Papa Francesco *is* a celebrity, at least in the Catholic world. Fans full of religious and celebrity crushing fever lined the streets of Monza along the path he drove to arrive to the park, their smartphones glistening in the sun as they stood on tiptoes, jostling to the front with their scarves and flags waving incessantly to get a glimpse and a good photo of the Pope, shouting his name to get a glance from him. Once he was on stage, the air was filled with hymns with an ethereal feeling about it. As the Pope began to talk and his image was broadcast on the screens, the crowd grew silent and listened to his gentle voice boom out over the loudspeakers. Proving he really is a Pope in touch with the present day, he began by saying that there would be a separate queue for those who wanted to take mass but needed gluten free bread! “God’s new encounter with His people will take place in places we would not normally expect: on the margins and peripheries”. He reminded us that finding joy in our daily lives can be challenging but this is only due to ourselves because of speculation or taking advantage of others. “memory, belonging, and seeing the possible in the impossible”. It was an incredibly moving afternoon and the sight of what was probably 1,000,000 people brought together to worship God was absolutely breathtaking and I’m not ashamed to say that I shed a tear or two. 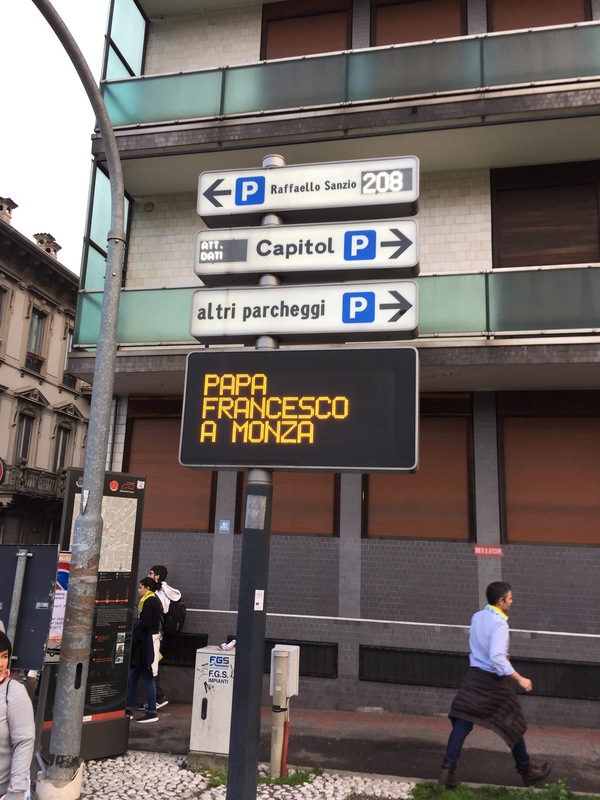 And as Papa Franceso climbed back into his Papa Mobile to wave goodbye, I left feeling uplifted and hopeful (until I saw the queue at the train station where that 1,000,000 needed to get a train back to Milan!!!). One of the first things he did when he became Pope was to ask the people to pray for him – proving he’s really down to earth and recognises that he needs prayers too, we all do! And that he’s not better than us. As a young boy, his father made him work giving him a strong work ethic. After being chosen as Pope, he returned personally to the place he had been staying to pay his bill, rather than send an assistant. He chose to live in a simple two-room apartment rather than the luxurious papal accommodations in the Vatican’s Apostolic Palace. He rejected the traditional golden Papal fisherman’s ring, and decided on a much more modest silver ring, all of the above showing his humility. At his first official dinner as Pope, he joked with everyone: “May God forgive you for what you’ve done”. When asked if he was a good cook, his response was “well nobody ever died”. What about you? What do you think of the Pope? I’d be interested to hear from religious and non religious view points.